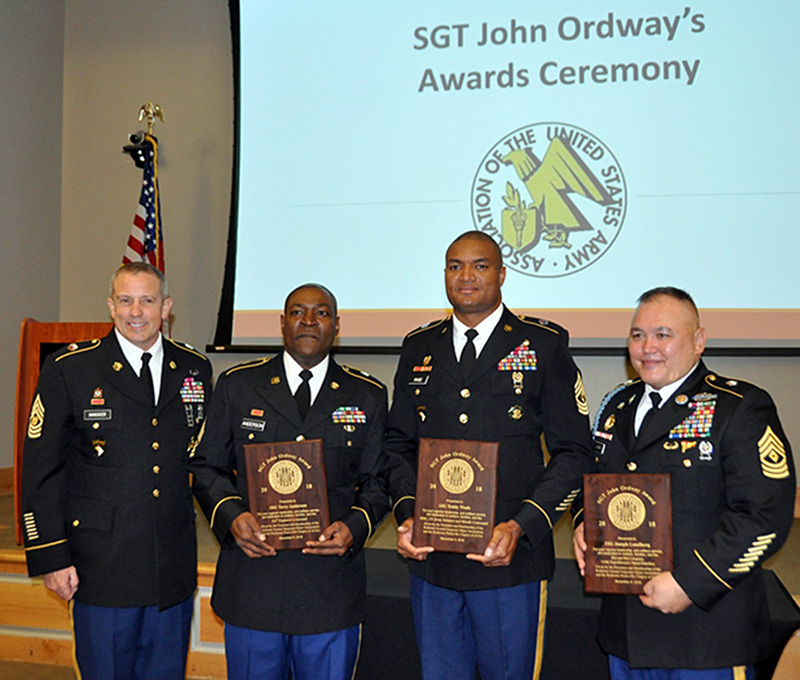 Three of the Army’s top NCOs received accolades for their leadership during a recognition breakfast presented by the Redstone-Huntsville Chapter of the Association of the U.S. Army. “I am an American Soldier, and I am [very] proud of it. But the most important NCO is not the sergeant major; it’s the first sergeant,” Command Sgt. Maj. Rodger Mansker, said Army Materiel Command’s command sergeant major, who was the guest speaker at the event held at the Jackson Center. First Sgt. Terry Anderson, the first sergeant of the Army Reserve’s Headquarters and Headquarters Company, 926th Engineer Brigade, out of Montgomery, Ala., received the award while his wife Arnethia and two of his three sons, Tiyrai and Tiyri, looked on. Representing the Army National Guard, 1st Sgt. Joseph Lundberg traveled from the Pentagon, where he is currently serving on active duty as the operations sergeant major for the Army Wounded Warrior Program. Lundberg manages the Advocate Support Branch that provides care for more than 12,000 seriously wounded, ill and injured service members and veterans across the United States and Europe. The Sergeant John Ordway Leadership Award was created with permission from Ordway’s descendants in 2005 to recognize the 200th anniversary of the Lewis and Clark expedition. Ordway, known to have been the only soldier throughout the expedition who could read or write, served in the capacity of first sergeant. He made sure the troops were taken care of with rations and supplies, and wrote letters home to their families.